TASCAM's incredible DR-40 lets you take true 4-track recording on the go! This impressively affordable 4-track recorder gives you all of the tools you need to capture audio anywhere in any environment. Want to record live music? Plug the main feed from the board right into the DR-40 and use the built-in microphones to capture the room. Want to record audio for video? Just plug your shotgun microphone into an input and enable phantom power. Dual mode recording, automatic level adjustment, and a built-in limiter all ensure that your recordings will come out sounding great. 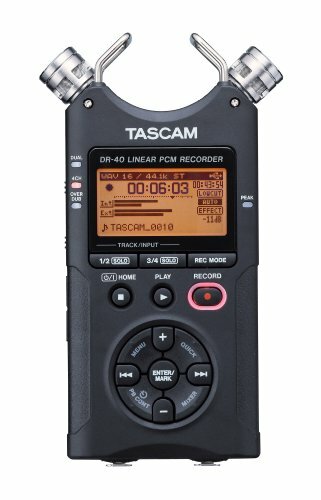 And the TASCAM DR-40 includes great practice and studio-style recording tools, such as a built-in tuner and reverb, making it an amazing songwriting tool too.